The National Livestock Identification System (NLIS) Pigs is Australia’s system for identifying and tracing pigs. It is a mob-based system that links pigs with the properties on which they have run. The NLIS enhances Australia's ability to quickly contain a major food safety or disease incident. It is implemented by industry in partnership with governments across Australia. Pigs weighing more than 25 kg must be branded with a swine brand (or an NLIS ear tag if no brand is available). The brand or ear tag must link to the PIC of the property from which the pigs moved. Under the NSW Biosecurity (NLIS) Regulation 2017, all pigs (including pet pigs, pigs raised for personal use and very small pigs) moving off a property must be permanently identified with either a swine brand (pigs>25 kg) or NLIS accredited ear tag, identifying the PIC of the property the pigs have moved from. Pigs weighing less than 25kg live-weight must be ear-tagged and not branded. 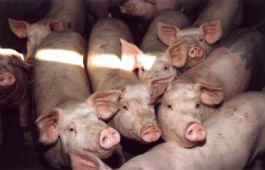 It is preferable that pigs greater than 25kg are branded, although ear tags are an option if a brand is not available. NLIS Policies, procedures and legislation – Compliance Procedure for Property Identification Codes, all published on NLIS Policy and Legislation webpage. PigPass is a national tracking system which provides real time information on the movements of all pigs in Australia.